This was sent from a customer that purchased the a centrifuge rotor to seperate coconut oil. last year i purchased the bowl and motor. We think this will work. we process virgin coconut oil. After trying few times, we figured out how to produce VCO using this centrifuge. before that, the bowl design is amazing and suit our method. In order to produce VCO, we have to perform two stages. 1st- Put the coconut milk inside (from the top) ~10kg. The water will trap inside, the cream (oil+protein) will flow out (there is a picture attached). The output is thicker than coconut milk. Inside the bowl, after we remove the water (without opening the top) from holes, we can see how thick the sediment (there is a picture attached). 2nd - we freeze the output for a while. (VCO freezing point is 24C). 3rd- we centrifuge it again, this time crystal clear VCO comes out. From 10kg coconut milk, we get 3L VCO. i'm satisfied. Before this i used fermentation 24 hour method. Then i have to wait until the oil is clear 3-4 days. Now, within a day. Building machine. View from the top. The completed machine. The byproduct from the second step of clarifying he milk. Clarified milk. After freezing the mixture is passed through the centrifuge. The liquid milk is retained in the rotor. Here it's being drained. 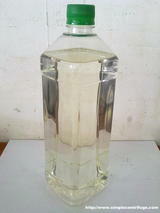 The Virgin Coconut oil, very clear oil. Didn't need any filter. The Virgin Coconut oil, very clear oil. Didn't need any filter.